Elizabeth and Jim were both born with a gene for wandering to check over the next hill or around the next curve. This condition may have been passed down to them by their ancestors who climbed on a boat and sailed west to places totally unknown to them. Upon jim's retirement, he jokingly said that all he wanted to do was photograph planet Earth. 50,000 images later, he has just begun and has barely scratched the surface of this great United States of America. Their primary mode of transportation is a relatively gas efficent Lincoln LS that has attained 32mpg while being encouraged along by a hefty westerly Wyomng tailwind. 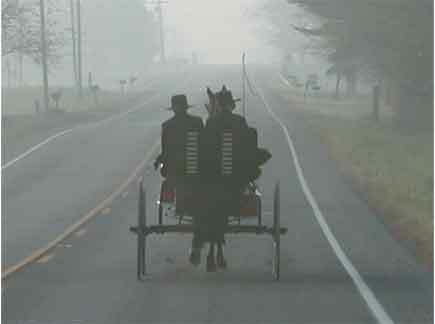 However, their mode of travel is not as efficient as the horse and buggy they came upon while touring a back road in Ohio. They are gone from their home several months of each year visiting parts of this great country not seen before--taking roads not traveled before--and occaionally returning to some of their favorite haunts. If the weather is threatning or there is a need to haul something other that several small suitcases, then out comes the big truck--a 1998 Chevrolet 1-ton crew-cab long bed. They also have other toys that get exercised a few times each year.